I think perhaps the hardest thing about new motherhood is the sleep deprivation. In fact, I think some of postpartum depression may be due to lack of sleep. Lack of sleep can cause irritability, lack of emotional control and lack of concentration. But it can also keep you from losing weight! A study by the University of British Columbia showed that adults who sleep less than seven hours per night are more likely to be obese. Why? It comes down to two hormones: ghrelin and leptin. Ghrelin’s function is to trigger hunger. Leptin’s function is to regulate energy expenditure and energy intake (in other words it tells you when you’ve had enough to eat). A lack of sleep produces more ghrelin and less leptin. 1) Talk with your spouse about ways he can help you get some shut eye. Perhaps he can take over some feedings. 2) Go to sleep when your baby does; even if that is at 7 p.m. It won’t last forever! 3) Sleep when your baby sleeps. Even though 8 hours is best, taking a nap when your baby does will help! 4) Say yes to help. Get a friend, mother-in-law or babysitter so you can get the extra shut eye. 5) Start a sleep routine with baby as soon as you can. I highly recommend Healthy Sleep Habits, Happy Child . 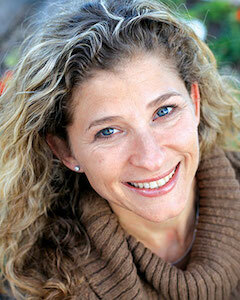 Lisa Druxman is the creator of Fit 4 Mom. She is a nationally recognized speaker, author and highly regarded expert in the field of pre/postnatal fitness.